Parents Anniversary Gift? Build a Bear Bunch to fit your needs, no more or less: Choose your favorite teddy bears up to 9 and place onto the chair the way you like. Put everyone's name and a gift message such as Beary Happy Anniversary for FREE handwritten personalizing. Add the impressive accessories for the extra personal touch. Best Bear Bunch, an original gift idea since 1988, A customized family tree for up to 42 named bears, So different, a best gift for those who have everything! is the cost for the chair and 4 bears. If your selection is different, your final price will be different. You will see your real time price while you are bunching bears below. Start by clicking on any hot spot on the empty chair. View the bears offered, click on the bear you like, and that bear will appear on the position. Scroll over the chosen bear and add the name. Scroll over again to add an accessory. Scroll over again to change. Design other needed spots one by one. It's ok to have some empty spots. We'll center everything. A girl bear wears a bow. The bow color varies. Our artist arranges properly. We'll write the bear names and your saying on the base (chair or plaque) in uppercase using our own special font. If your Internet Explorer doesn't read this tool properly, use Chrome or Firefox or call 609-518-1828 to order. More questions? Go FAQs to the right! Choose your favorite teddy bears up to 9 and place onto the chair the way you like. Bear Bear Bunch is a trade name for our original custom gift idea formerly known as Bears Etc. (1988) then Bears in Chairs. Equipped with the intuitive tool, Best Bear Bunch makes it beary easy for you to create a bears-in-chairs gift in the way you like. Simply pick your bears, place on the chair and put the names for free personalizing. 8 X 4" over 4 lbs. For up to 9 bears and 9 accessories. Place them on the empty chair along with the names. 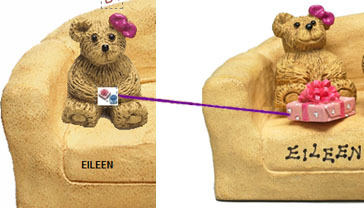 Click any hot spot on the chair and view the bears offered. Click a bear to choose and add it on the spot. Mouse over an added bear to add/edit a name. Mouse over an added bear to add/edit an accessory. Apply the same to the next spot till all needed spots are filled with your selection. Type a saying on the chair front. Click on a spot to edit it. Review your creation and hit add-to-cart for checkout. Empty spots are fine since we'll center everything nicely. Special request? Put in the Comment box at checkout. A girl bear wears a bow in her hair. The color will be arranged properly when your Bear Bunch is created in our workshop. As a general practice, if your Bear Bunch has bunch of girls, the bow colors will vary from red, pink, purple, magenta to blue. You can request a specific color in the Comment box at checkout. Mouse over the added bear to add an optional name. Type an optional saying/message on the chair front. The names and saying will be written nicely ON the chair by an experienced artist. Add For a spot where you have added a bear, mouse over the bear, click on "Add Accessory" and then a popup "Shop Accessory by Category" will be shown. 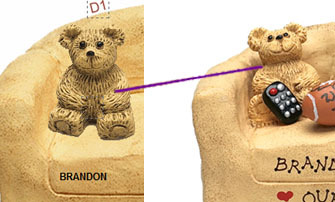 Click an accessory to choose it, and upon chosen, the thumbnail will be displayed by the bear. For a spot where you want an accessory but NOT a bear, you will need to add a fake bear first: click on the spot, find the fake bear that is named "NO-Bear" located in the end and click it to choose. Now you can mouse over the No-Bear and add an accessory. Size Displayed An added accessory is displayed in its thumbnail on the spot. Its actual size is much larger. Any accessory allowed to choose shall nicely fit the bear/spot. Arrange Our artist will place your accessories by the bears as you specified, and arrange the whole space properly. A football may be held, for example, but a hat would be worn while a dog will be seated, depending on your selection and the space. Change Mouse over the added accessory to edit it. Special request? Put in Comment box at checkout. You pay only for the necessities (chair, bears and accessories) you selected to build your bunch. You pay nothing for the personalizing. You will see the real time cost while building a bear bunch. You can easily change the total cost by managing your necessities: mouse over the added bears and edit your selection, at any time before you hit add-to-cart for checkout. Tip 1 The cost for the smaller bears range from $2.99 to $5.99 each. The difference is significant. Tip 2 The accessories are beary impressive but pricey. They are optional. Tip 3 A bear bunch for a core family could be as little as $25 while a four-generation bear bunch can be over $100. You can build with the four generations or leave out the middle generations. Tip 4 A Bear Bunch is for the whole family, with everyone personalized and honored. So you may not need to buy each family a holiday gift when you have a Bear Bunch. Your bears, accessories, names and saying will be centered on the chair when your gift is created in our workshop. The whole thing will be arranged beary nicely by an experienced artist. Special request? Put in the Comment box at checkout. You can email to save and share your creation by clicking "Share My Creation," the golden tab that is located above "Your Creation Price." A click on the email, either sent or received, will display your creation. Email to yourself for a later use. Email to others for a review or edit or simple share. Anyone who has your email can edit your creation, email to other and even hit add-to-cart for checkout. Our Bear Bunching Tool registers your selection of bears, names and accessories, and stacks the images on your screen whenever your selection happens. This preview (the stacked images) helps you monitor your creation. Together with "Your Creation Details" that is located below, the preview also makes it easier for you to have a complete review of a possible order before you add to cart for checkout. Lettering: Computerized (preview); Written (Final). Font: Arial (Preview); Bearish Cool Dots (Final). Place: May be off the spot (Preview); On the chair by the bear (Final). Presented: In one mechanically straight line (preview). Nicely centered, with the letters up and down in turn, in 1-4 artistically straight lines (Final). Size - present for example: Thumbnail (Preview); Full size that matches the bear (Final). Presented - present for example: Image on bear (Preview); put on Couch (Final). Facing: Direction varies - In the example below. The boy faces downward (Preview); Faces to the same direction as the main bear's (Final). Painting color: Review the above images and compare the main bear's skin/fur. You may see that the preview is lighter than the final product's. Our bear necessities are hand painted, and the painting colors vary a little bit, from lot to lot. That is one of the reasons why our customers love Bear Bunch over 25 years. Bow color. A girl bear wears a bow in her hair and you cannot pick a color here. But our artist will arrange the colors properly when creating your Bear Bunch in our workshop. As a general practice, if there is a bunch of girl bears in an order, the bow colors will vary from red, pink, purple, magenta to blue. Further you can request a specific color in the Comment box at checkout. So your actual Bear Bunch will be more colorful than its preview.